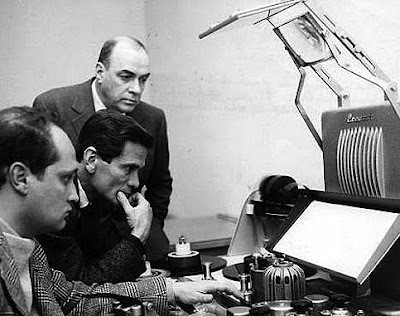 Pasolini had been approached by producers to make a film entirely from newsreel footage. What he created was an impassioned Marxist screed that uses footage of everything from the 1957 Republican National Convention to Castro's revolution in Cuba (with footage of Marilyn Monroe and Sophia Loren thrown in to spice things up) to criticize man's selfish nature when doing anything but working together for a common goal of peace and well-being—or fighting against the bourgeoisie. As usual, Pasolini focuses on the lower class as the unsung and downtrodden heroes of his piece. And a narrator drones on and on over the footage, tying all of its disparate pieces together. Timely as some of the issues brought up seem to be at this stage of our own lives, to this writer—liberal as he is—the left-wing propaganda was laid a little too thick and deep. Which is probably why the film's producers sought to balance Pasolini's segment with another one by writer Giovanni Guareschi, an ultra-conservative as far to the right as Pasolini was to the left. Pasolini was outraged, and chose to abandon his original concept of the film, shortening it to some extent. Giuseppe Bertolucci, younger brother of Bernardo and an admirer of Pasolini, decided to reconstruct the film from the director's original script. Bertolucci used footage he thought would appropriately illustrate Pasolini's ideas, and attached this to the original 1963 version as a prologue of sorts, clearly marked with a title announcing its addition in 2008. Then he added an epilogue comprised of newsreel and interview footage of Pasolini himself, as an angry young political advocate. The strongest segment is still the original 1963 version. You can sense the indignation of the Pasolini even in his proxy's narration. It's almost as if you sense the passion of youth—Pasolini's youth—in that segment, standing in sharp relief against Bertolucci's more sedate expression—the expression of an older man—despite the fact that he still used Pasolini's original text. In a fascinating misfire, the inclusion of Pasolini's fierce voice in the third part of this triptych, bolsters his original segment (the body of the new film) while further undercutting Bertolucci's prologue. Seeing the fiery Pasolini in full political mode seems to highlight the fact that Bertolucci just can't seem to muster the same level of rage as his antecedent did. This is a continuing series of posts on some of Pier Paolo Pasolini's most notable works.